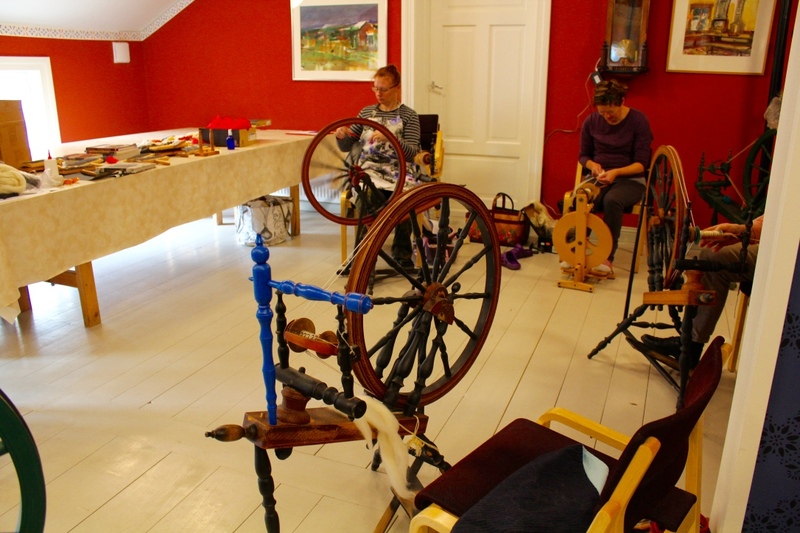 Last weekend I taught a beginners’ class in wheel spinning. 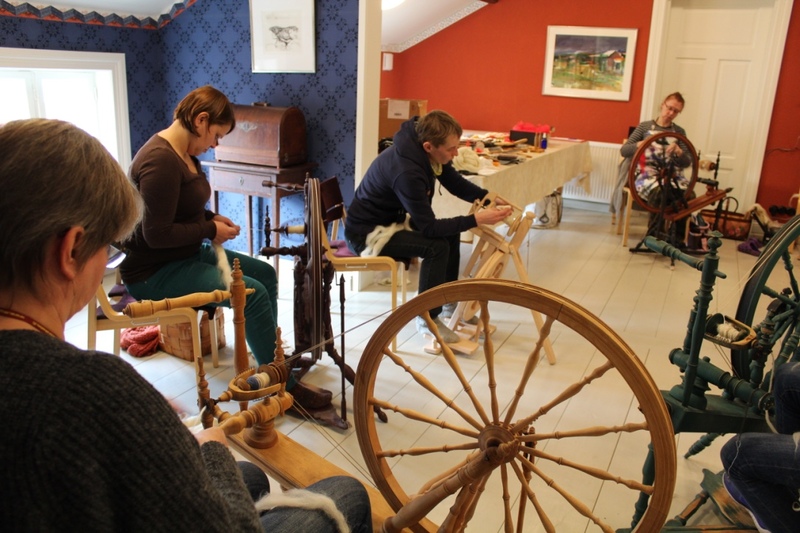 Some of my pupils also took part in a spindle class last spring, and I was happy to see they wanted to learn more. Five old Finnish Saxony wheels! Two more Finnish Saxonys, and my Louet “Peerie” Victoria that I lent to one of the participants as the green wheel wasn’t in mood for working. The owner fixed it in the evening, but got so fond of my Peerie (who wouldn’t!) that she wanted to go on using it during the second day. Finnish spinners will know what this is about: three wheels from Kiikka, called “kiikkalainen” in Finnish. 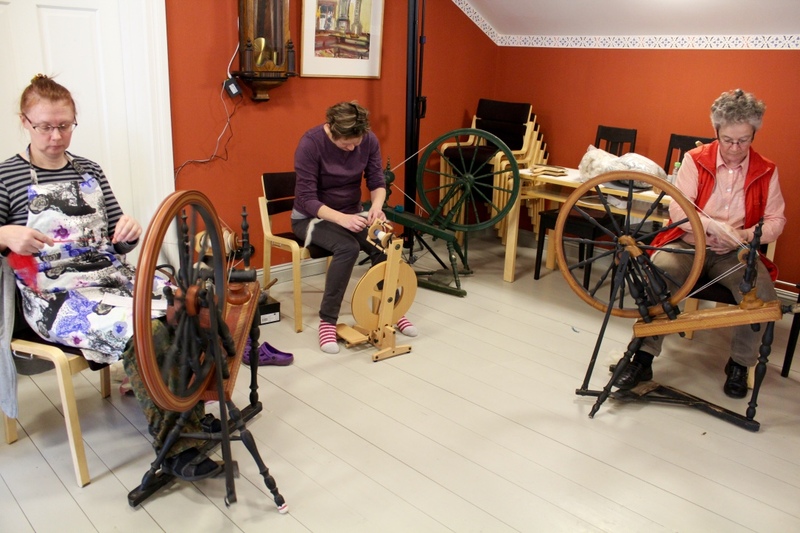 The municipality Kiikka was famous for its skilled wheel makers, but all that ended when people stopped spinning. Luckily there are lots of old wheels in the second hand market, and among them hundreds of kiikka-wheels. You see mine (I call her Eevi) with the blue distaff stand in front. I use it for spinning in public, while my other two antique Saxonys are for home use only. There was also a new German wheel, but I forgot to ask about the maker. Germany was, and is, an important country for spinners. All the wheels you see in this photo have their origin in Germany. The Saxonys came to Scandinavia from Germany centuries ago, and the upright wheels have continued to develop into interesting new forms there. I think the wheel in the front may be a Toika wheel, but if someone knows what it is, please tell me! It’s unfinished. EDIT: A kind reader has sent me a photo of a Toika wheel from the 80s. It’s much more robust than the wheel in the class, and many details are different. I therefore think the one in the class isn’t made by Toika. My pupils had various skills from none to quite advanced. It’s always difficult to teach a beginners class to people who needs very different kinds of knowledge and skills. I had prepared myself for a situation like that, but you’d still need to be able to split into at least three persons! One who makes the wheels work, one who teaches the basics in spinning, and one who teaches advanced techniques. But it was fun, thanks to the nice participants! The beautiful room in the Crafters House at Stundars is an inspiring place for small groups. I hope we can continue in the spring with fiber knowledge, fiber preparation, and one or two new spinning techniques. That was wonderful. It is difficult to teach when there are several different levels going on at once. I have been spinning for so long that I don’t know what I do! Will have to remember soon as I am going to help someone next week 🙂 Loved seeing all those spinning wheels, make my hear sing!! Why is Germany such a significant place for spinning? What are the modern German wheel brands? How can I find out more about spinning in Germany? The German area was a significant economical and cultural area for centuries from the 13th century onward. Products like spinning wheels spread over large areas with the merchants from the Hanseatic League. In our time several small wheel makers have designed interesting new wheels. You can find out more in the German spinning groups on Ravelry. This one seems to be the biggest: http://www.ravelry.com/groups/spinnernetz. Or you can google “Spinnrad” and “Spinnräder” and see what comes up. October 17, 2015 - 2:21 pm Marilyn F.
John Horner was an engineer, like his father, who invented and made improvements to textile machinery. He spoke many languages and traveled extensively on the continent as an adviser on the installation of textile machinery. He was especially interested in the history and development of the linen industry and the promotion of the Irish linen industry. His book “The Linen Trade of Europe during the Spinning Wheel Period” was produced in 1920. During his travels he studied and collected spinning wheels and accessories that now are the Horner Collection which he presented to the Ulster Museum in 1907-08. This small book “Spinning Wheels” is based upon Horner’s catalogue on the subject of spinning wheels and although some authors feel it is difficult to actually pinpoint the origins of the spinning wheel, this is what Horner discovered. Thank you Marilyn, that’s very interesting! I have a dissertation from Helsinki University: Veera Vallinheimo, “Das Spinnen in Finnland : unter besonderer Berücksichtigung schwedischer Tradition”. In the chapter on spinning wheels she states that flyer wheels were first introduced in the 17th century in Scandinavia. There is a Saxony wheel from 1739 in my local museum. I hope you all know The Spinning Wheel Sleuth? Lots of interesting wheel history there. October 18, 2015 - 1:52 am Marilyn F.
Well, let’s see, if Jurgen was working on the flyer wheel in 1530, then they found their way to Scandinavia in the 1600’s, and you have one in a local museum dating from 1739, the timeline makes sense. The use of Spinning Wheels must have spread pretty quickly and been a very important tool to use to speed up the process of making clothing, etc. How fascinating that you have a 1739 wheel so close by. I wonder how they found out it was that old? In fact, I’ve discussed the dating with a wheel collector in Australia a couple of years ago. It looks as if the date has been added to the drive wheel later, and he could also see some repair that I hadn’t noticed. There’s a photo in the banner in my old blog, Hillevis Trådar, and more on my flickr page, album Verktyg-Equipment-Työkalut. I’m Hillevi3 on flickr. Oh this is very interesting, thanks Marilyn. That would be a great collection to explore at the museum. Thank you Barbro for the reminder about the Spinning Wheel Sleuth. October 18, 2015 - 1:46 am Marilyn F.
What a nice idea Rebecca, to actually visit the Ulster Museum and see Horner’s collection and his original manuscripts/catalogue. Hopefully it all still exists. I should have begun with compliments on this fascinating post. It is not often we focus on the wheels themselves in talking about spinning. So interesting to see the wheels common in different places. Thanks! Yes, I thought the wheels would be interesting for spinners outside Finland. You find the same kind on Saxony wheels in Sweden, but also what we now call “Norwegian”. That’s logic, when you look at the map and see Sweden in between Finland and Norway. But the Saxony originally came from Germany, as I wrote in the post. 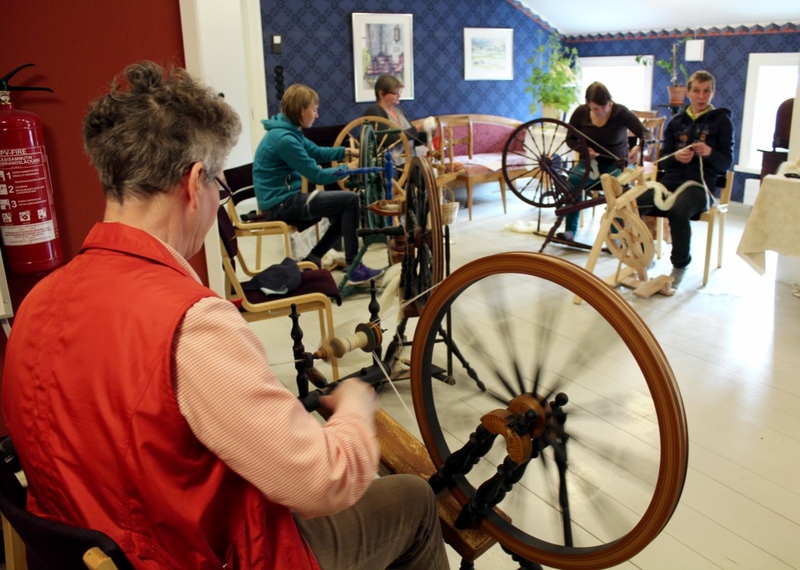 Many Swedish spinning terms are German loan words. Oh! My fascination and curiosity just grows and grows. Thanks for the German links. It is posts like these that make me realise how Americentred is the online/print spinning culture I have been exposed to in Australia! There are so many spinning cultures that I have barely glimpsed. That is again very interesting. Was your friend based in Melbourne? I wonder if this was her experience of an urban centre or a country town? I have just recalled something I read recently in Richard Rutt’s History of Handknitting about the popularity of knitting for middle and upperclass ladies in the early 1800s in England arising from the growth of fancy (fine) wools in Saxony after the fall of Napoleon redistributed Spanish merinos accross Europe after being controlled by Spain for a very long time. The Saxony merino took dye very well and started a knitting fashion among ladies as I guess it differentiated itself against coarser homespun yarn for stocking knitting common as income generation amongst English rural poor. Now, it makes sense to me that prior to industrialisation (and this would have been just prior to industrialisation) of wool spinning, this fancy yarn coming out of Saxony would have been handspun. Would you agree? I don’t have Rutt’s book, which makes me upset quite often… As far as I know he knew what he was talking about. Knitting history is a quite new field, so there’s a lot to research. I’ve seen shelf after shelf of Rutt’s research material in The Knitting Reference Library in Southampton, but I didn’t have time to explore it. My friend lives in Adelaide, and the group she visited meets there, but I don’t know where the spinners come from. I’m sure there are other groups that would suite her better! It is a fine book but the original collection would be amazing. Does your friend know of Local and Bespoke? Great blog of amazing South Australian maker, Dyer, Spinner. She recently spun with newspapers! Thank you! Yes, you’re right! I forgot I had mentioned it in a blog post, good to have confirmation here also. What wonderful pictures! I just love those old Finnish wheels, and in fact I just got a Kiikkalainen wheel all the way from Finland. I have been trying to find more information about these wheels but am having little luck. Do you happen to know hwere I can find out more? Hi, saw your wheel in the Revelry group Antique Spinning Wheels, which I believe is the best place to find out more. I was just going to suggest you look there, but you already found the group 🙂 Hope you’ll have a good time with your Kiikkalainen! April 7, 2017 - 3:54 am Marilyn F.
What about the Spinning Wheel Sleuth. I hear they have lots of info on older / antique wheels, although I am not a subscriber. Yes thanks, that’s also a good idea! I’m having a great time with my Kiikkalainen, Petra.I was referred to an old thread about these wheels where I learned more. And I searched the Spinning Wheel Sleuth’s site but didn’t find anyhting, so I sent her a message and got a response saying she hadn’t heard about Kiikkalainen wheels and could I tell her more 😉 so I will tell her what I know. April 7, 2017 - 9:54 pm Marilyn F.
That’s wonderful Olga that you found information and now you can share it with others. I am not familiar with the Kiikkalainen wheel either, but always enjoy learning about wheels I’ve never heard of before. Good detective work on your part. Thank you, that is so nice! I love old wheels. I love that they have been made to earn their keep and have done just that. That’s wonderful, Olga! The SWS doesn’t have much about Finnish wheels. I suppose not many wheel owners have told them about their Finnish wheels. April 8, 2017 - 3:48 pm Marilyn F.
I think Finnish wheels are some of the most beautiful ever made, especially since Barbro has shared so many of them on her blog over the years. I might be a little prejudiced since my first wheel was a Toika. It seems Finland has had a strong fiber history that a lot of the world has not heard about.